Giana Sisters: Twisted Dreams was a surprisingly original 2D platformer with a fascinating switch mechanic that completely changed the look and feel of the game at the touch of a button. We awarded it an 8/10, praising the visuals and creative gameplay mechanics. The game was initially a PC release, however, and this version received an expansion that Wii U owners never got to see. In order to give Wii U gamers the full experience, Black Forest Games announced its intention a while back to release Giana Sisters: Twisted Dreams Director's Cut, a version of the game that would include the expansion and be released at retail. 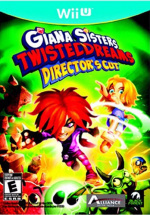 Initially, Giana Sisters: Twisted Dreams Director's Cut was due out in September, but it was pushed back to October. Unfortunately, it appears that the game has been delayed once again, as Toys "R" Us now lists it for a 9th November release for North America. There's still no word about any sort of release in Europe, but keep your fingers crossed. What do you think? Will you be picking this up whenever it comes out? What did you think of the initial game? Drop us a comment in the section below. They should update the eShop version. Not rebuying it for five extra levels. "......but Giana Sisters games are forever bad." I would buy the DX version, if it gets a EU release. "A delayed game is eventually good"? Terrific game. Would buy a box version. but does it have the 2player of PC version? "There's still no word about any sort of release in Europe, but keep your fingers crossed." I'd buy it if it came out in Europe. I've yet to complete it, but have really got into each time I've played. A bit tricky sometimes though. Curiously the game is made in Europe but only has a US release date! The latest two Giana Sisters games were both atrocious though - the DS one was bland and primitive and the WiiU one was just badly designed. @MysticX Haha, there are exceptions obviously! Didn't that pass between, like, four developers?